Throughout these MARI and NUKE tutorials, we'll focus on how to create a matte painting from a concept, then convert it into an actual camera projection environment. 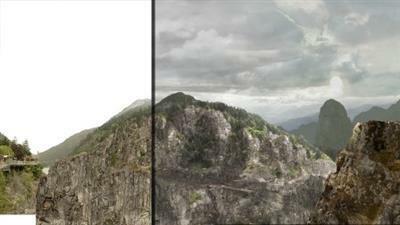 We'll blend all the elements to make the matte painting/camera projection more realistic. Next, we'll learn how to model assets and create UVs to replace the use of planes for projections. We'll then convert the camera projections into existing texture maps and finally put all the elements together. In conclusion, this MARI and NUKE training will help individuals develop the skills to create a VFX environment from beginning to end utilizing multiple pieces of software in the process.